An ACL (anterior cruciate ligament) tear in the knee is one of the most well-known sports injuries, primarily because it is very common and can bench an athlete for the rest of the season. The ACL is one of the two stabilizing ligaments in the center of the knee, which makes it crucial for athletes who play high-contact sports or sports that require them to pivot and move quickly. 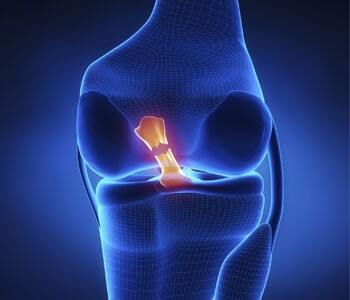 An ACL tear may cause extreme pain and swelling immediately after the injury, but in some cases may be mild. Most people seek treatment immediately after the injury, and diagnosis can often be made in the office. Upon physical examination (which includes moving the knee into a variety of positions), the doctor can usually determine if there is a tear. The first step of treatment is to reduce swelling and improve motion. Then, patient and doctor need to decide whether physical therapy, or surgery plus physical therapy, is the best option. Surgery involves replacing the ligament with a tendon from another part of the patient’s knee or leg, or with a tendon from a deceased donor. The surgeon makes small incisions around the knee through which he or she inserts instruments and a viewing scope.